What is my MSMS username? You might have created an account with our service or an account was created for you by Millennium Systems International at the time you purchased Millennium. Here is how to find out what it is. I lost my password and or username - what do I do? Your Millennium software is capable of sending and receiving text messages through the service provided by Upside Wireless, a partner or Millennium Systems International and provider of US and international text messaging services through its service called MillenniumSMS. 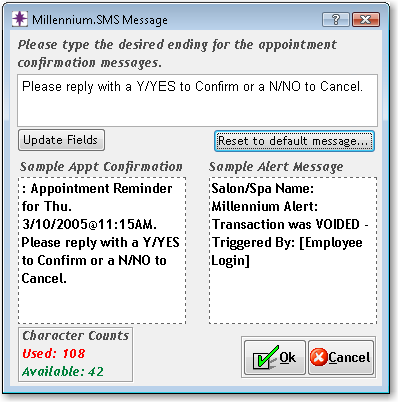 Millennium can send text messages that contain appointment notifications, informational messages or promotions for your products or services. Your Millennium can also receive messages from your customers' phones. These inbound messages can be replies to appointment reminders (confirmations) or responses to your marketing messages. The image below explains how it all fits together. How to configure Millennium for sending text messages? How to have text messages from my customers delivered to my Millennium? Your customers may send replies to your confirmation alerts. When they do, your Millennium will automatically collect these messages and based on their content update Appointment Book screen. When someone replies with Y or Yes, the associated appointment record will change color to green. I am not receiving customer responses in my Millennium. How can I fix this? How can I change text of messages my customers receive? Millennium creates text of outbound messages in two parts. Part one contains your business name, time and date of the appointment. This cannot be changed. The second part of the message you can change in your Millennium. Go to Data->Business Information, click Preferences, then MillenniumSMS. On the screen that follows, click Format Message and make changes as desired. How many characters can I send in one message? My client accidentally opted-out of messaging. How can this be reversed? Is SMS the same as text messaging? What is the correct format for the phone number? Please click here for the list of account types we offer, payment options and pricing. If you cannot find a plan that suits your needs please contact us and we will custom build one for you. The service is offered on a month-to-month basis. You never enter into a long term contract. You can cancel at any time. How can my customers opt back in after they opted out? Telephone Customer Protection Act is a US federal legislation that prescribes how electronic promotional campaigns are conducted. If sending promotional messages of any kind it is VERY important that you full understand and comply with this law. Please see details on TCPA here. How can I contact Millennium Systems International for assistance with my Millennium software?